Engineers racing against the clock have plugged sea defences which were damaged by storms in Cornwall. Powerful storm waves wrenched one of the Bude Canal's outer lock gates off its fixings on Monday. With water draining out of the canal basin, a sandbag dam was built to hold the water temporarily. 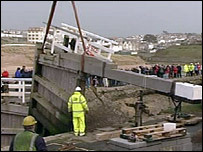 Four-tonne concrete drainage pipes were also lowered by crane into the empty canal basin to dissipate the power of waves at high tides. The lock is one of only two in the UK to open directly onto the sea. The local council is now speaking to the engineers about fixing the gate which was damaged on its hinges. Paul Masters, assistant chief executive of North Cornwall District Council, said: "Our staff have been absolutely brilliant and we have had a fantastic response from the Environment Agency and local contractors, in fact we couldn't have managed without them." The episode also revealed some unexpected finds in the mud at the bottom of the canal, including a shotgun which was taken away by the police. The outer gates were also badly damaged by storms in 1997 and new lock gates were installed in 2000.